A MaskedWrestlers.com Exclusive !Packaging : Box (Dim. 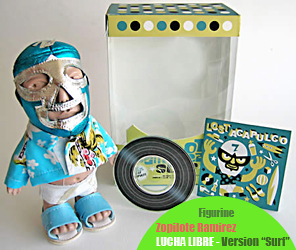 12 x 7 x 18 cm)Height : 17 cmWeight : 400 grMaterial : Cooked resin, hand madeDesigner : ZOVECK Studio - Mexico - Limited EditionContains : - A masked figure of Zopilote Ramirez, - A tissue cape,- also inclued a mini LP with 4 tracks Unreleased of the mexican rock (garage) band Lost Acapulco- A "Surf" shirt- Sandals- Interchangeable drawersEl Zopilote Ramirez is a 100% Mexican superhero that fights against evil, corruption, lazy suppliers, morose customers , stepmothers wicked and stupid sellers. He has no special powers, nor extraordinary strength or courage. 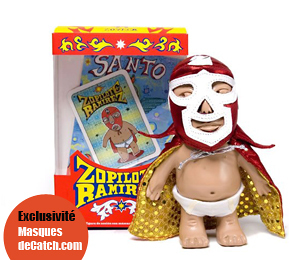 But he relies on his mask, his cape and underpants, and he does what he can, as he can when he can and if God wills it.Also available as «Surf».Warning : this is not a toy - not suitable for children under 3 years old.